Spine injuries can occur during motor vehicle accidents, in rough contact sports, after a fall, or by hitting your head against a hard surface, such as when diving into a pool that is too shallow. These accidents can cause injuries that range from mild cases of back or neck pain to injuries that can cause paralysis of the rest of the body below the level of injury. Whiplash is the common term used for a hyperextension injury to the neck. Though the neck is a very flexible structure, it can be injured when the weight of the head exceeds the neck’s ability to control its motion. The injury usually happens when the head is suddenly jerked back and forth beyond its normal limits during a car accident, rough contact sports, or a fall. This jerking motion can cause over-stretching and tearing of the neck muscles and ligaments and can cause the discs between the neck vertebrae to bulge, tear or rupture. 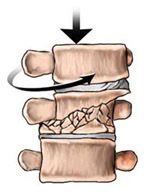 The discs that act as shock absorbers between the vertebral bodies of the spine can be damaged during an accident. When this happens, the material in the center of the disk can be pushed out from where it normally is, a process called disk herniation. A herniated disk can put pressure on the spinal cord or nerves to the arms and legs. In situations when a disk ruptures very quickly, as in the case of an accident, then the nerve does not have any time to adjust to the increased pressure and it may stop working. 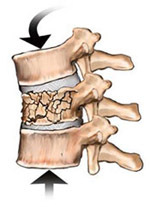 Fractures and dislocations of the spine demand early and accurate diagnosis so that treatment can quickly be introduced in order to produce a painless, stable spine and prevent pressure on the spinal cord and/or nerves. When the neck or back is injured in very violent accidents, the bones can be broken or pulled forcefully out of normal alignment. Fractures and dislocations of the spine are very serious injuries because there is the potential for damage to the spinal cord if the patient is not taken care of very carefully. 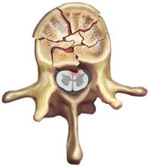 The most common types of fractures affecting the low back are compression fractures which usually result from a fall. They can be diagnosed with an x-ray. With most compression fractures, bed rest, physical therapy and conservative medical care is effective. However, there is a small chance that the compression fracture could be caused by a secondary medical condition. Usually your physician will give you a thorough neurological and physical exam in order to rule out osteoporosis or malignancy. Burst fractures usually occur through a violent compressive load resulting in failure of both the anterior and middle columns of the vertebrae. In this case vertebral height is significantly decreased. This fracture is considered unstable and requires immediate stabilization of the body and medical attention. F lexion and compression fractures frequently occur at the T1 and L1 levels. The amount of anterior column failure depends on the amount of compressive force. Usually there is some loss of vertebral height with this injury, but as long as the middle and posterior columns are intact, this fracture is considered stable. 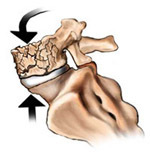 This type of fracture is also known as a chance fracture, and is often caused by seat belts in cars. In this fracture, all three columns of the vertebral body can fail and there may be injury to bone, ligaments and discs. An interior subluxation is often encountered. This fracture is considered unstable and required immediate stabilization of the body and medical attention. Usually coupled together with or without flexion. Compression effects can occur on the lateral margins of the vertebral body while torsional and translational forces may affect the body or disc and ligament structures. Anytime there is a partial dislocation of the spine it is referred to as a subluxation. This is a situation where there is no longer a normal side by side position between the articular (joint) surfaces. The term dislocation is used when there is no longer any degree of contact between the articulating (jointed) surfaces. Extension dislocations in the cervical spine are very common and are often missed on x-rays. With an extension dislocation the posterior ligaments remain intact making the dislocation stable. In order for a significant posterior (extension) dislocation to occur there must be a tear in the anterior longitudinal ligament. Each year in the United Sates, there will be approximately 50,000 new spinal cord injuries caused by accidents. A spinal cord injury occurs when the cord itself is crushed, stretched, or torn by the accident. Unfortunately, this is still an injury that can not be reversed or cured by modern medicine. More than half of these injuries involve the cervical spine, and most of them happen to young men. These injuries are incredibly devastating to the patient, their families, and also to their communities. There is currently a lot of research being done on ways to minimize spine injuries by designing cars for better safety, improving protective gear like football helmets, and educating people about the dangers of certain activities. There is also a lot of research being done on how to care for someone immediately after they have had a spinal cord injury, and also what kind of rehabilitation is best for them.